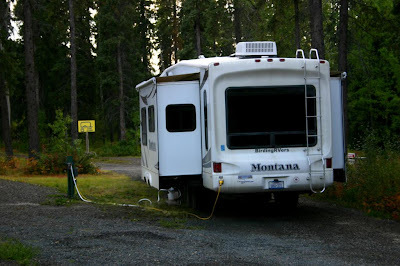 The way most people in RV caravans do an Alaksan trip is to go up the Alaska Highway and return down the Cassiar Highway. 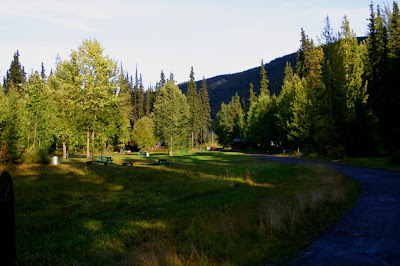 The Cassiar Highway in British Columbia was built in 1972 as a 450 mile gravel road. Every year since then they have been paving more of the road, as of today the road is mostly paved. There is a 16 mile stretch of gravel before the village of Iskut and another 12 mile section after Iskut. As with most roads in the north, the gravel sections are better than the paved sections because they have less potholes and frost heaves. This is true wilderness country with only about 6 places that sell gas in the 450 miles. They are not gas stations but at grocery stores in the villages of Dease Lake and Iskut and 4 “resorts” along the highway. All of the guide books and most people say that the Cassiar is a ‘must see’ because of the spectacular scenery. 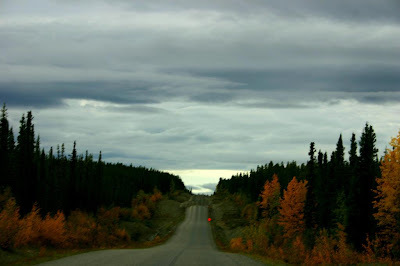 Unfortunately for us our first day down the Cassiar was dark, gray, cloudy and it rained about half the day. We did notice that the trees are greener here as fall hasn’t taken a hold like it has north of Whitehorse. The first 50 or so miles of the road has a lot of frost heaves and top speed is 30 MPH or less. It took us about 6 hours to cover 200 miles with the top speed being only 40 MPH and most of the way, even less. Although, the gravel sections are smoother, with the rain they are pure mud. 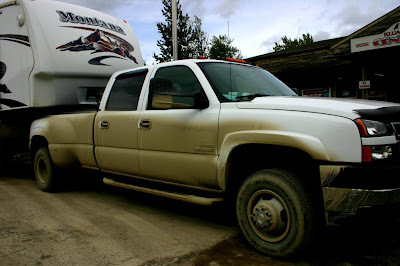 As you can tell by the pictures the truck and trailer got even dirtier than they did when we drove the Top of the World and Taylor Highways into Alaska. After our 200 mile drive today we stopped at the Tatogga Lake RV Resort. 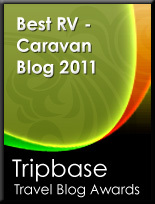 We have come to understand that here in the north “resort” means: it has a few cabins and a few RV spaces. This resort has no TV cable or satellite reception, no WIFI, no hot showers or any other amenities that would come to mind when you hear the word “resort”. We had to hose the trailer down to open the slides. 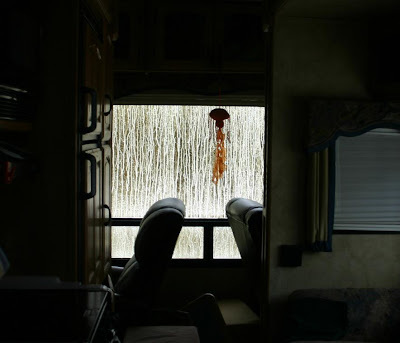 This morning, at the Nugget City RV Park, the power went out for about 20 minutes (thankfully after our coffee had brewed). However, up here when the power goes out so does the water because there is no power to the pump. 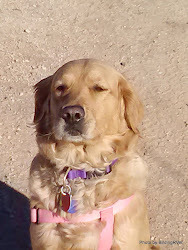 This morning when the power came back on the pump did not. 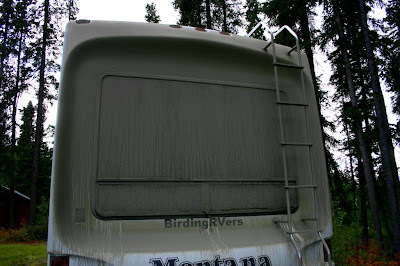 Even when we left the RV Park at 10 AM the water hadn’t come back on. Here at Tatogga Resort about an hour after we got here the resort ran out of water do to some problem with the pump. Fortunately, we always keep about 20 gallons in our fresh water tank while traveling but, hadn’t expected to depend on it this much. As further evidence how late in the season we are there was very little traffic on the road today and as of 7 PM we are the only ones in the RV area of the “resort”.